Today's post about about our trip to Belgium has been preempted by some breaking news. It's only twelve more days until the Journée Grand Siècle at Château de Vaux le Vicomte! Worried that our options would be limited if we waited until the last minute to select our dresses, Sara convinced me that we should go to the costume store this afternoon. 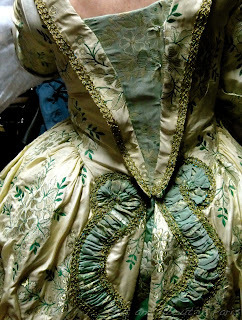 As soon as my eyes adjusted to the dim light in the front room, I was momentarily surprised to see a man in a shirt with ruffled sleeves and breeches trying on a pleated coat. We were definitely in the right place. The 17th century! After enquiring about our budget and giving us several dresses to try, the salesman escorted us to a large fitting room where there was a woman from the early 1900s admiring herself in the mirror. Next came the hard part, figuring out how to dress ourselves. Believe me, it's not as easy as it sounds. First, there were the side hoops or paniers, which meant that we required three times as much space as normal. Next, there were all kinds of hooks, laces and loops to fasten. After dealing with those complicated thingamajigs, it's not surprising that I put the first dress on backwards and didn't even realize it until I had an epiphany while helping Sara fasten the ribbons on the bodice of her dress. As we quickly discovered, there are definite advantages to wearing jeans! 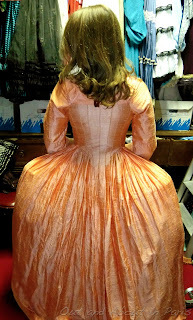 After 90 minutes of trying on dresses reminiscent of those worn by Kirsten Dunst in Marie Antoinette, we moved on to selecting our wigs. Again, it wasn't easy as it sounds. When the salesman presented me with the first wig, one with two points that resembled horns, I laughed out loud and asked if he was serious. He was. I decided to go with a less-fashionable model, a powdered one with an updo and three curls dangling down the back. If you would like to stroll back in time to the 17th century and picnic on the lawns of the Château de Vaux le Vicomte, mark your calendar for Sunday, May 26. While it isn't necessary to wear a costume, there will be ones for rent at the château. Please click here for additional information about the Journée Grand Siècle. Perhaps I'll see you there. I'll be the one with my dress on backwards! Sara and I rented our costumes at Sommier Costumier, 3 Passage Brady, 75010 Paris between 20 and 22 Blvd de Strasbourg and 43 rue du Faubourg St. Martin. Tel: 01 42 08 27 01. Update: Due to inclement weather, the Journée Grand Siècle has been postponed until June 16, 2013. Stunning! I am so bummed I won't be there in time for this event, it looks amazing! Sara and I both said how much we wished that you would be here for the Journée Grand Siècle! We asked the costume store if there are any special events in July. There aren't. :-( Something else that I would really like to go to is the masked ball at Versailles. Too funny that you realised your dress was on backwards whilst sashing up Sara - did it take you ten hours to take off and put on right-side-round? 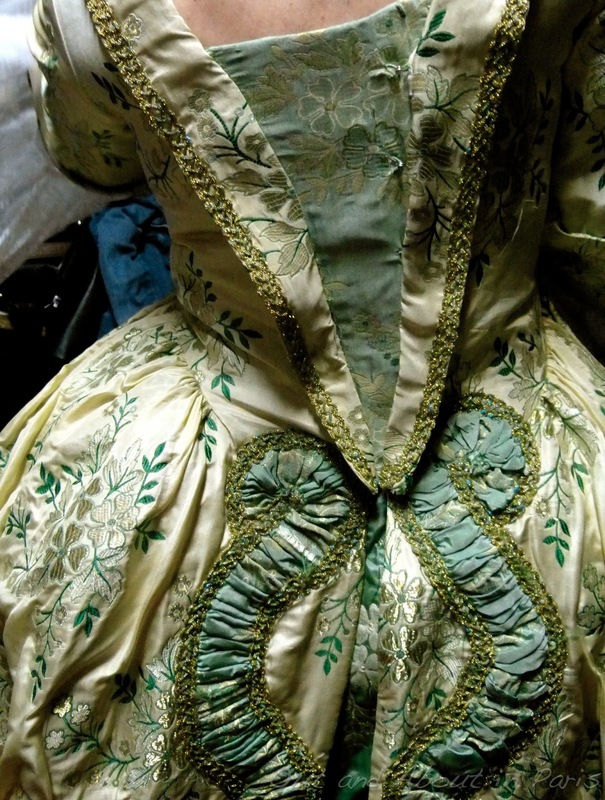 And I've passed that costume store plenty of times but never realised they had sumptuous 17th C numbers. The costume store is a treasure trove, Daisy! I just had a brainstorm - you should do costumed treasure hunts at the Louvre. That way you would have a reason to go in and try on some of their amazing costumes. Seriously, we could have spent an entire day there! You were in our thoughts while we were in your 'hood. We ended up having dinner at the Mauritius restaurant in the Passage du Prado. When we pick up our costumes, we're going to try one the restaurants that you suggested in your post about FSD. Can't wait to see pictures from the event! The only problem is that I don't know how "authentic" I'll look in my costume with a camera hanging around my neck. I guess that I could always stuff it under my wig and take it out for photo opportunities! ;) I saw some incredible photos on Flickr that people took at the Journée Grand Siècle 2012. It seemed as if they were taken at a fete in the 17th century! Can't wait to see the pictures, how fun!